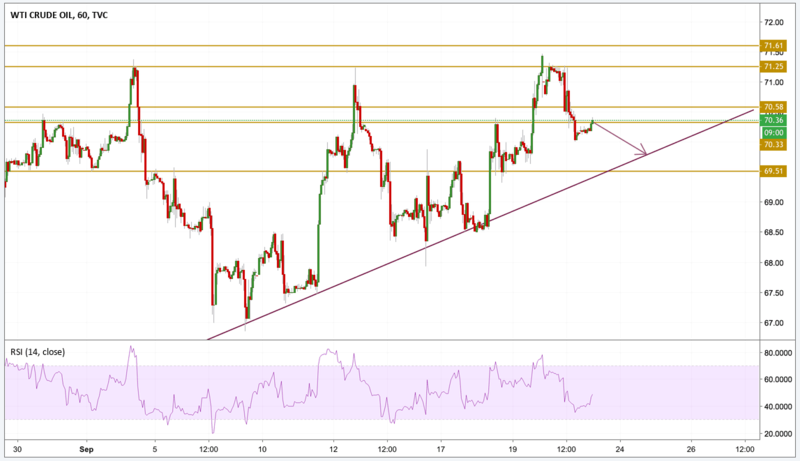 Crude oil is seeing some pullback from recent highs after US President Donald Trump once again took on Twitter to express his anger towards the OPEC asking them to gain control of crude prices. OPEC meets on Sunday in Algeria, but the discussion is expected to revolve around current output production levels. Trump is insisting that the organization should be striving to do more to alleviate upward price pressure from oil as Iran prepares to face extreme drawdowns in global demand. US oil prices retreated to lower levels but still holds above the $70 level. Prices lost momentum after printing recent new highs but the uptrend pattern is still valid and we are focusing next on the purple trend line presented on the chart for the price to retest it in order to pick up the right momentum again.